Spend a week living in the Austrian Alps and you will discover the secrets of mountain life. Spend a week living in the Alps with 200 like-minded adventurers, and you’ll rewrite the entire rulebook for yourself, with adventure at the top and all trivial matters at the bottom. Since it’s inception, The Ski Week Austria has sought to push the boundaries of what is possible in an alpine environment. We have dreamt up, brought to life, then periodically redefined the kind of experiences you may never have dreamt possible on snow. The result is so much more than a ski holiday, and brings together skiers and snowboarders from all over the globe for a journey of adventure and exploration, with a generous dose of dancing thrown in. First chairlift is as much a mindset as it is an experience, you’ll understand when you are surrounded by the go-getters and life attackers of our merry band. Suit up and head out with the morning sun, high five early-birds along the way and soak up the energy of old friends, new friends, and soon-to-be friends. Load the chairlift and take this opportunity to drink in the moment as you sail through the treetops. Before you know it you’re on the slopes, with wind in your hair and snow underfoot, and a vast playground of world class terrain at your toes. Do you stick with the squad you met at first chair, or venture out for some solo time with the mountain? Whichever you choose, be ready to bump into Ski Weekers all over the map, and feel welcome everywhere you go. 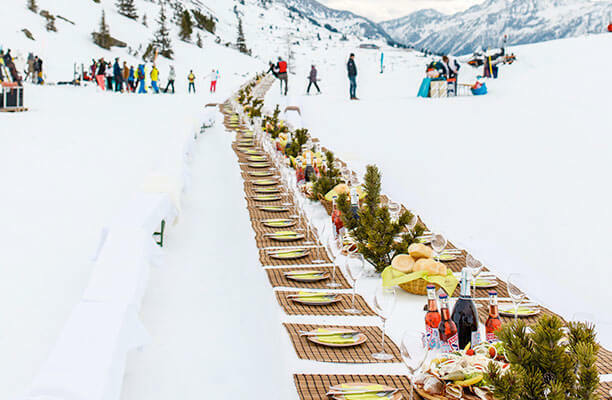 Ski into the right valley and you’ll find a 50m banquet table built entirely from snow, and laden with gourmet alpine fare. Grab your seat at the highest long-table in Europe, then toast to friendship, breaking bread, and making merry in the mountain tops. There is something very special about seeing the faces of adventurers celebrating life, totally exposed to the elements, amid a stage of glorious mountains as far as the eye can see. When the time comes to prove yourself at the pond skim, there is no holding back. Embrace your inner superhero, gather the courage and represent your crew by water skiing across a crystal blue reservoir of freezing alpine water. The DJs are behind you, the judges are ahead of you, and the crowd is waiting. Legendary cheers go to the victors, as well as the crashers. You may as well go fast! When the stars come out and the scene is set, only then do we light the fires at the snow fort. Dress warm and gather with your crew, as we light our lanterns and follow a trail up through the forest. Hidden in the wilderness you will find a custom built snow fort, complete with glühwein cauldrons, fur lined igloos, and tasteful music filling the air. Don’t forget you adventurer’s mug! Shed your outer layers and reveal the traditional bavarian garb that means only one thing, Oktoberfest is here. Close out The Ski Week Austria with an authentic private dinner in a legendary mountainside ski alm, where the walls are as old as the village itself. Sing german drinking songs with a full stomach and fuller heart, and look back on a week of new friends, epic victories, and world class adventure. End the night with a magical touch for your closest friends, by hiking to the igloo camp with a napsack of goodies to enjoy by the campfire. Shared blankets, hot chocolate and ghost stories are on the menu when it’s just you and nature. Sometimes the simple experiences are the best ones, especially when they’re followed by freshly brewed coffee in the morning.